Update (2/2/17 @12:57pm), the male has been identified. Thank you for your assistance. 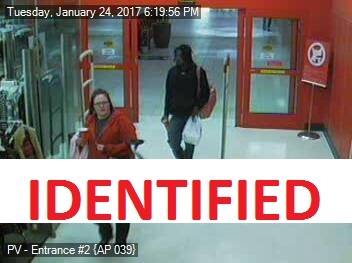 Update (1/27/17 @4:41pm), the female has been identified. We are still asking for help in identifying the male subject. Thank you. Detectives are asking for assistance in identifying the following two individuals. They are suspected in using a credit card that was stolen from a vehicle in the parking lot of Bio-Life Plasma Services in Coralville and using it at several local stores. If you have any information in regards to their identification, please contact Iowa City Area Crime Stoppers.